This is a delicious and organic dairy-free alternative to regular macaroni and cheese! 100% vegan pasta and cheese blend is great for a quick and delicious meal. Semolina Shells & chReese is $3.19 per box. This is my favorite brand of vegan mac and cheese. They don't taste just like the non vegan versions but better. From Anonymous of Vail, Arizona on 7/22/2015 . 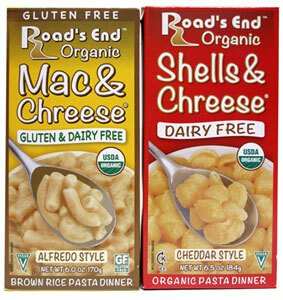 The semolina and chreese was edible, the best vegan mac & cheese I've tried and much better than the pretty much inedible Pastariso and Earth Balance versions, but Road's End wasn't crazy fabulous. I'm not sure a fabulous vegan mac & cheese exists. From kris of West Orange, New Jersey on 9/10/2013 . I really like the Cheddar with Shells and i always have some around. I have also just bought the chreese sauce to use on things (potatoes, vegetables). I just add the water or almond milk and earth balance but don't follow the directions. Very high in protein too! I did notice a "different" flavor recently as the other person said...not sure why but if they changed the ingredients they should go back to the way it was!!!! From Adam of University Place, Washington on 7/5/2013 . So nostalgic! The shells are my favorite - quick and comforting with a little earth balance. That said, you could easily make just as good a mac n' cheese yourself, but it's nice to have a few boxes of Chreese in the cupboard for when you're busy or just feeling lazy. Allergen This item is manufactured in a facility that also processes wheat and soy.